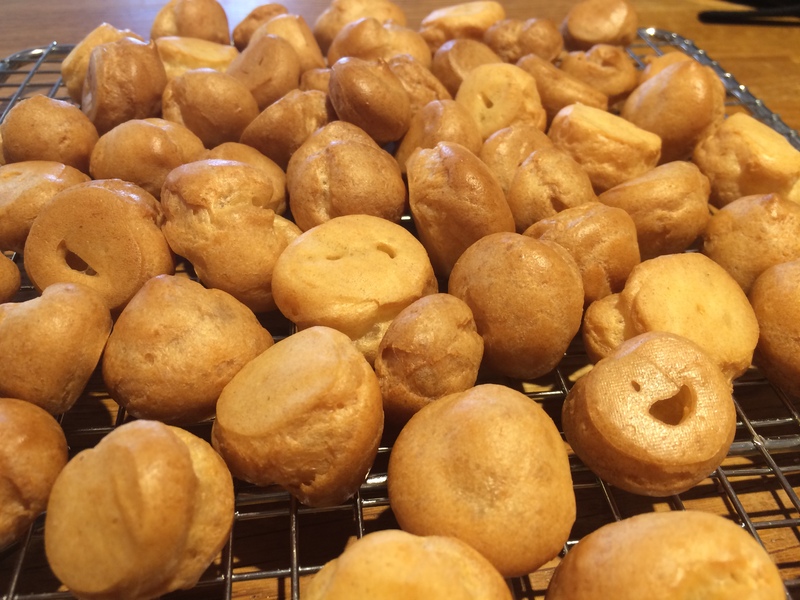 I have never attempted choux pastry before as it always seemed fairly daunting, having seen many a disaster on ‘The Great British Bake off’ or ‘Master Chef’. But actually its surprisingly easy and value for money. The only major things I have found to watch out for is piping out the right size of pastry and patience when adding the egg ‘a little at a time’ and don’t just pour all of the last bit in the jug at once! I decided to be creative with my fillings by choosing two different types, one mocha and one salted caramel. There is no question as to which one was the favourite – can you guess? 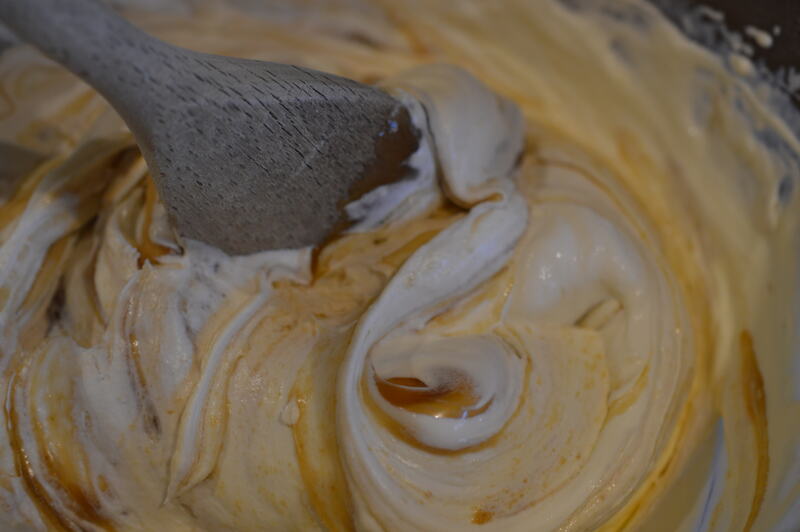 Yes you guessed it – salted caramel all round! I used a ‘four egg recipe’ for my pastry which makes around 60 rolls but I have listed a ‘two egg recipe’ which makes approximately 30 which is plenty. Pre-heat the oven to 190C and line two baking trays with greaseproof paper. 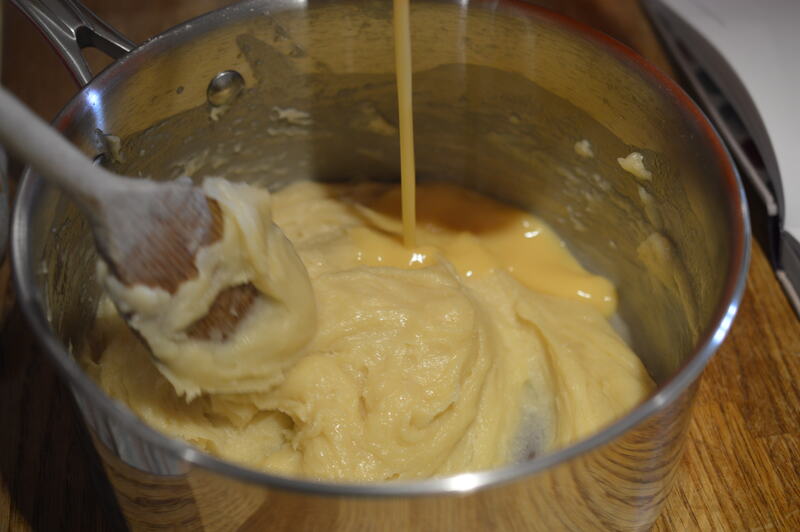 Place the water, butter and salt into a large saucepan on a low heat until the butter has melted. Turn the heat up and bring to the boil. As soon as it has started to boil remove from the heat and add the flour, stirring until it has all blended into a ball. Next add the eggs a little bit at a time beating fast into the hot mixture until it has all blended and the pastry is of a nice dropping consistency. 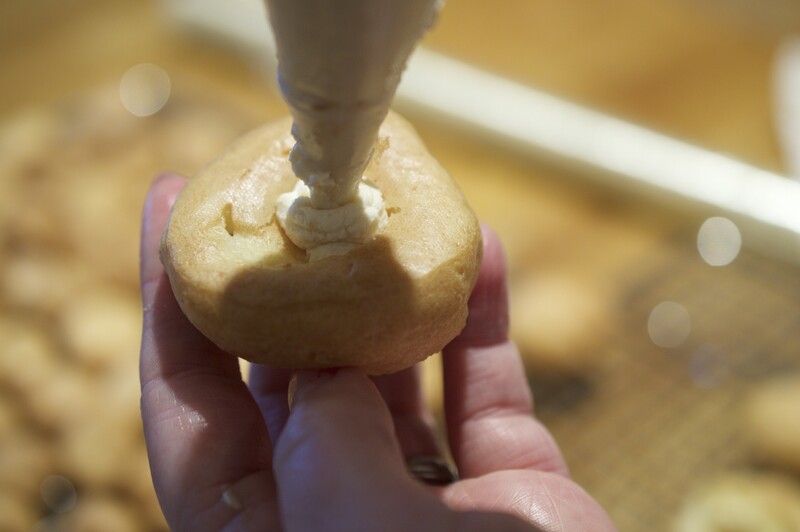 Pour the pastry into a piping bag with a large circular nozel alternatively place into a ziplock bag and snip off the corner or spoon on with a teaspoon. Pipe circles of roughly 2cm diameter across or two teaspoons onto the parchment leaving roughly 1 inch space in between. 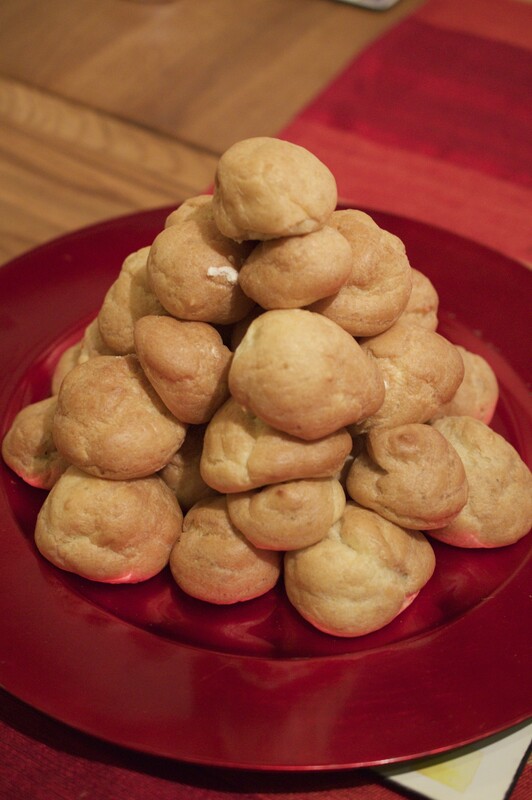 Place a baking tray filled a small amount of cold water into the bottom of the oven followed by the baking sheets and time 20-25 minutes by which time the profiteroles should be golden brown – if not leave in the oven a minute longer. 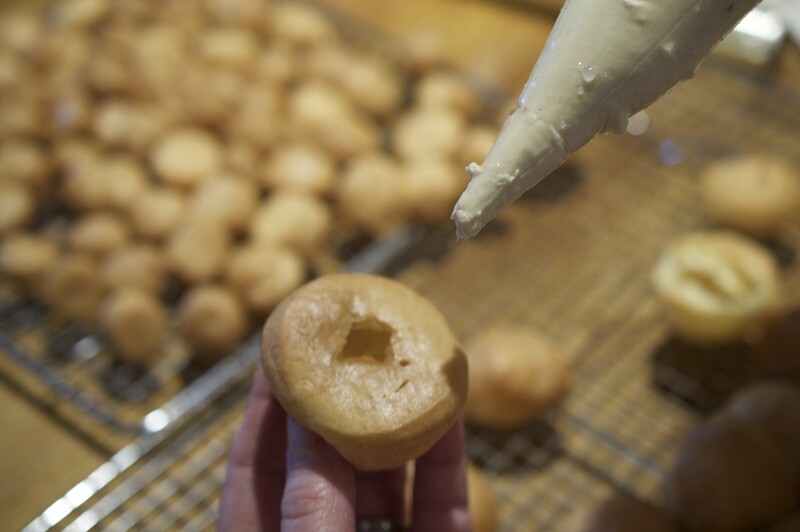 Immediately place on a wire rack and pierce a hole in the bottom to allow the steam to come out. 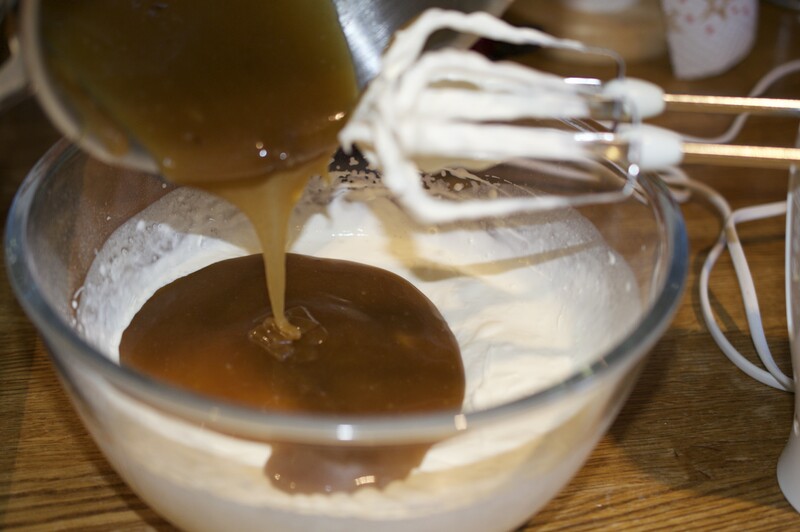 Once the profiteroles are cool follow the recipe for the salted caramel filling here Salted caramel and chocolate Profiteroles or make a nuttella or mocha filling by simply whipping 300ml of cream until just pillowy then fold in two tablespoons of nuttella or mocha spread. 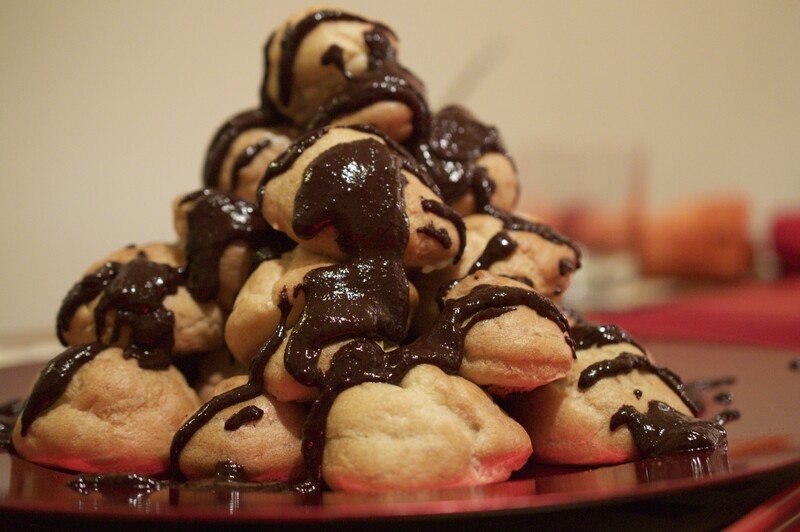 Using a piping bag, fill the bag with either the mocha, nutella or the salted caramel mixture and then fill each profiterole. Stack as desired (sometimes cocktail sticks help keep the stack in place!). 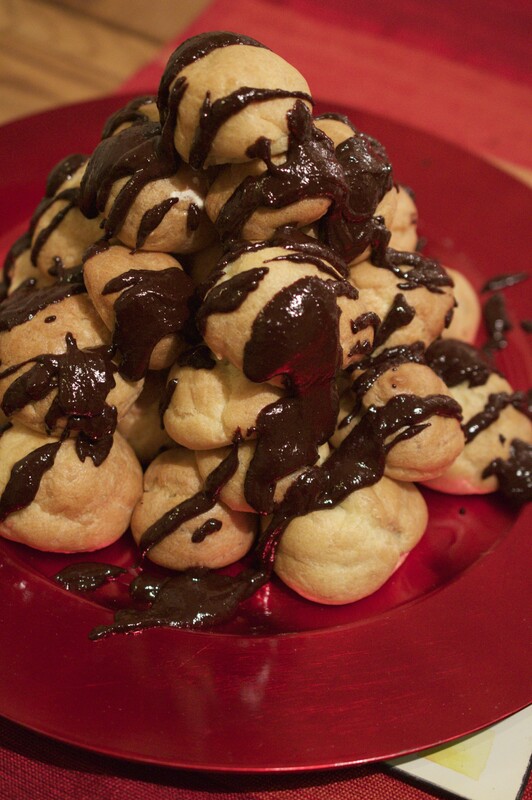 To make the topping (I doubled this leaving extra to dip the profiteroles in), place 100g dark chocolate, 30g butter, 50g castor sugar and one tablespoon of golden syrup into a pan and heat gently then drizzle over the profiteroles……yum! Absolutely scrumptious. One of the most ‘moreish’ things I have tasted in a long time, Definitely the salted caramel – it’s so different and up-lifting!